The headline real GDP number of 2.8% does not sound too bad until you dig beneath the surface. A full 1.9 percentages points of that 2.8% was inventory replenishment. Real GDP vs. a year ago is +1.6% and that is on a recession track as well. Treasury five-year note yields fell to a third consecutive record low after slower-than-forecast U.S. growth added to speculation the Federal Reserve will expand asset purchases to spur economic growth. Ten-year note yields fluctuated as stockpile rebuilding accounted for 1.9 percentage points of the 2.8 percent economic expansion, sparking concern growth may be weaker than expected in the first three-months of this year. Fed Chairman Ben S. Bernanke said Jan. 25 he’s considering additional bond purchases to boost growth after the Federal Open Market Committee announced that the target lending rate would stay low through late 2014. 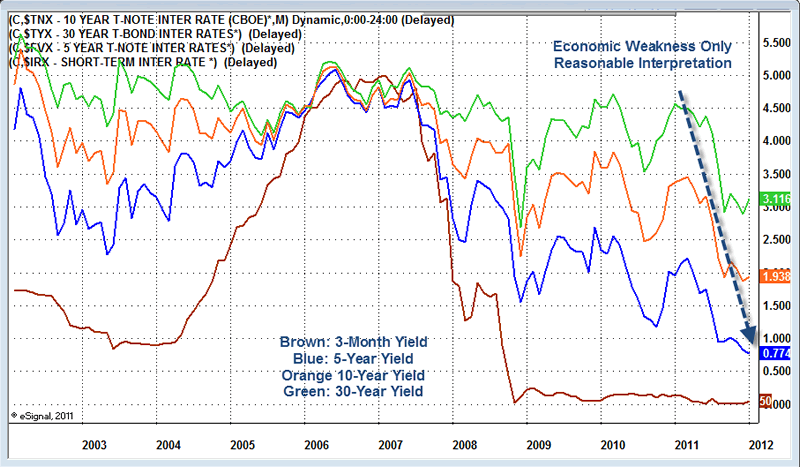 Sustained economic weakness is the only reasonable explanation for this decline in yields. Yes, there is Fed intervention. However, the reason the Fed is intervening is "sustained economic weakness". However, the Fed's actions are counterproductive. Driving down interest rates does not encourage bank lending, rather it does five things the Fed does not want. Low interest rates clobbers those on fixed income - See Hello Ben Bernanke, Meet "Stephanie"
As the chart illustrates, the latest YoY real GDP, at 1.6% is up from last quarter's 1.5% (to two decimal points it's 1.56% versus 1.46% for Q3). 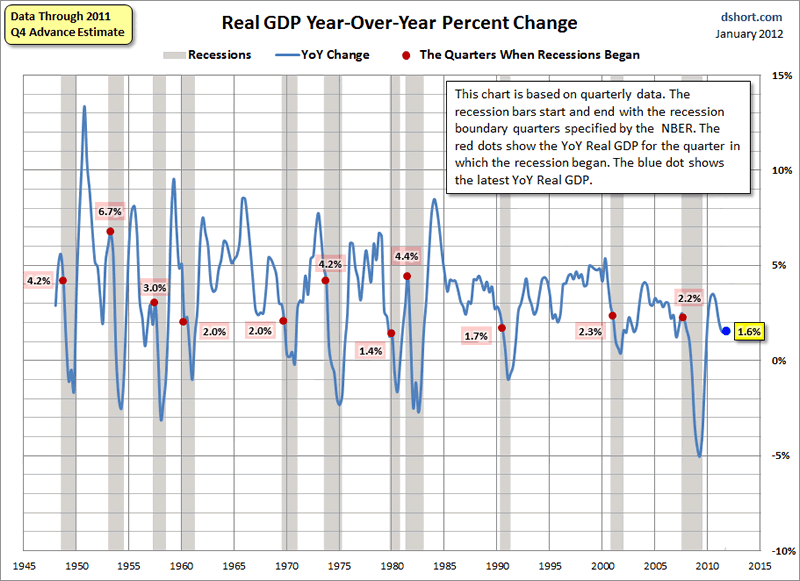 At 1.6% the YoY number is below the level at the onset of all the recessions since quarterly GDP was first calculated — with one exception: The six-month recession in 1980 started in a quarter with lower YoY GDP (at two decimal places it was 1.42% versus today's 1.56%). And only on one occasion (Q1 2007) has YoY GDP dropped below 1.6% without a recession starting in the same quarter. In that case the recession began three quarters later in December 2007. In contrast to popular belief, recessions typically start with GDP in positive territory. As you can see, Real GDP vs. a year ago is +1.6% and that is consistent with a recession track. It is highly likely Bernanke was aware in advance that a full 1.9 percentages points of that 2.8% rise in GDP was inventory replenishment when he pledged on Wednesday to "Hold Rates near Zero "At Least" through Late 2014" and opened the door for another round of Quantitative easing as well. Nonetheless, for reasons noted above, another round of quantitative easing will be counterproductive. The beneficiaries of Bernanke policy will be the 1%, not the 99%. © 2012 Mike Shedlock, All Rights Reserved.